As the nature wakes up from winter rest, Russians greet some of the most loved and dear holidays. International Women's Day, Orthodox Easter and Labor Day are the national holidays in Russia which – if you happen to visit it in spring – will allow you to dive into the rich cultural heritage. And if you wish to feel the country's incredible spirit and glorious past and see its present strength do come here for the Victory Day that is on May 9 – Russia's most revered holiday. On our Moscow tours English you will be introduced to the country's celebrating traditions as a local! On March 8 Russians celebrate International Women’s Day. During this day women receive special attention and enjoyable gifts from children and husbands. Chocolate and bouquets of roses or fresh spring flowers – are traditional presents of the 8th of March. Some couples go out to dine in restaurants and cafés while others stay at home to watch a big concert on TV dedicated to all women. The weather is usually sunny and warm on this holiday and air is filled with elusive scent of flowers carried by nearly every man for his beloved woman. 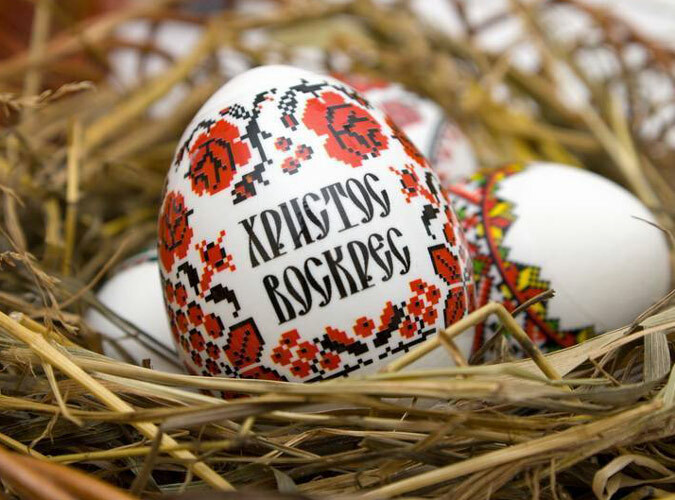 Easter – is truly one of the holiest holidays in Russia which celebrates the Resurrection of Jesus Christ from the dead. It takes place on the 12th of April as majority of Russian population is of orthodox origin. Though Easter will be celebrated on the 12th of April this year, this holiday is moveable and commonly held at the beginning of spring. Needless to say, this holiday always takes place on Sunday so people can focus on this holy day. Easter is rich in many traditions which are dedicated to worship Our Savior. Customary it starts with breakfast consisting of coloured eggs and kulich – a blessed by the priest bread usually with raisins and sprinkles on the top. Some people go to churches to rejoice in the Resurrection of Jesus Christ, others pray at home or watch ‘live’ translation of a holy mass. During this period of time people greet everyone with words ‘He is risen!’ and kiss each other on the cheeks three times. Children play with coloured eggs beating their ends against one another to establish which egg is the toughest. Church bells sing of Holy time of Jesus Christ, inviting people inside their walls to worship. Victory Day is one of the most important holidays in Russia and the former Soviet Union countries. On the morning of May 9, 1941, the Soviet government announced the victory over Nazi Germany. Since that time Russians celebrate this date to commemorate the brave deeds of those who risked or gave their lives for our freedom in the Second World War. This day is without a doubt recognized as a national holiday in our country, so everyone can concentrate on this glorious event. This year people will receive an additional day off on Monday because Victory Day falls on Saturday. Early in the morning the President of Russia lays flowers on the Tomb of the Unknown Soldier to honour everyone who fell in the battles without recognition. This signifies the official beginning of the holiday. Streets and main squares of the country are decorated with Soviet flags and orange-and-black laces – a symbol of Second World War. Throughout Russia breath-taking parades catch the eye of everyone who comes to recognize these tragic years. Moscow and St Petersburg hold the largest events. Traditionally thousands of soldiers from different countries take part in the main parade on Red Square under the proud leadership of the current Russian President. Lines of sharply dressed military men march in perfect unison down the square with fine weaponry and flags in their hands. Rows of military machinery demonstrate their greatness in front of thousands of people under mighty sounds of the army orchestra. It’s not a surprise to see many veterans in the streets, dressed in clean and pressed uniforms proudly showing medals of Honor displayed on their chests. Some bring accordions or guitars to perform war-time songs. Tears of joy and pain often run down their cheeks when they sing of lost comrades or tragedies they have endured. Grateful children and adults give veterans flowers and listen to their heart wrenching stories. All day long marathons of vintage military films are played on the television along with ‘live’ translation of the concert which always takes place on Red Square. At the end of the day nearly everyone locals would gather on main squares to watch fascinating firework dedicated to every soldier participated in ruthless battles for our peaceful life.